Julia & her mom headed out to a Rubber Stamping convention (if you can imagine such a thing) today. They are actually making a weekend of it! They have a hotel room with a pool and everything. They will be having a nice mother-daughter weekend together. Me, I will stay home and do some stuff around the house, maybe watch a movie or something. During recess in school today, Julia was playing soccer with a bunch of her schoolmates. Someone, accidentally or carelessly, kicked her hard in the leg. It caused her a lot of pain, and it swelled up "like an egg" (I was told). The school staff immediately had her get off of her leg, then had her elevate it and put some ice on it. Julia's mom came and brought Julia to the doctor to get it checked out. 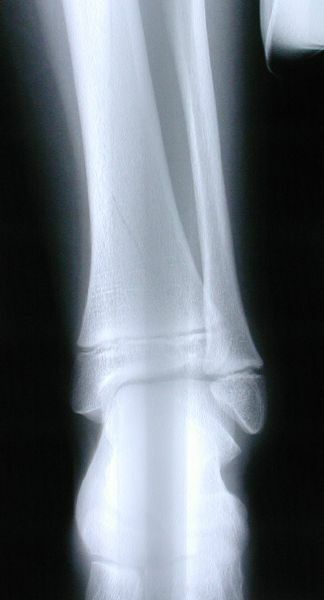 They took 3 x-rays, and 2 of them look okay, but the third seems to show some bone displacement and a possible crack. They got referred to an orthopedic specialist next for another opinion. The orthopedist agreed that it is broken; it's pretty clearly visible in 2 of the x-rays. 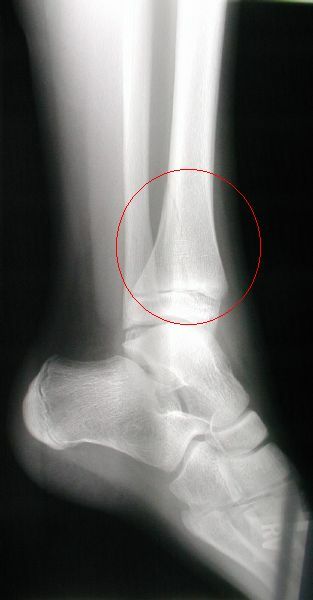 The break is actually in in her left distal tibia, above the ankle, and just above the bone growth plate (phew!). Julia is now sporting a fiberglass cast, one that is not a walking (weight-bearing) cast. She'll have to wear it for about 4 weeks, then they will take it off and replace it with an air cast. She'll have to be on crutches for about 6 weeks total. Crutches are a whole other story. We got some serious run-around from various medical equipment suppliers about the availability of youth-size crutches. Finally, we were able to borrow a pair from a friend of Julia's who needed them last fall. Also, we were advised to keep the cast dry by using a device called an AquaShield. 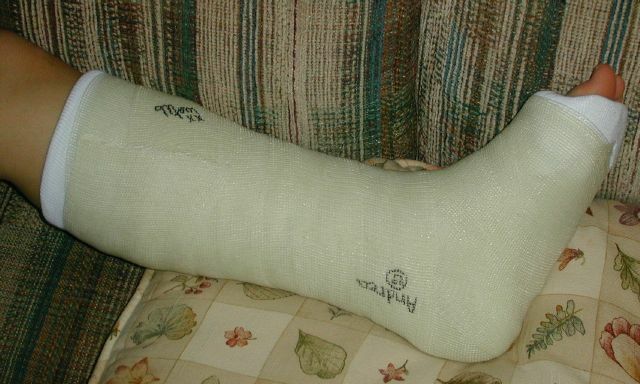 This is a rubberised plastic bag that fits over the cast and encases it completely, and seals at the top, above the cast. She took a shower tonight, and it worked well. Tonight, Julia did not sleep well. She went to bed but she was in a fair amount of pain. About 10:30, we gave her 400mg of ibuprofen, and set her up to sleep in a reclining chair. She ended up sleeping about 6 hours before needing more medicine. Julia is staying home from school today and tomorrow at least. This is going to require some logistical juggling to make this all happen. Julia's mom is staying home with her today. Julia will need her homework assignments picked up and dropped off, plus other stuff going that need to be taken care of. Luckily, Friday is the last day of school and the homework should be very light this week. Julia was in a lot of discomfort today. She needed 4 400mg doses on ibuprofen during the course of the day, and she seemed to be in a fair amount of pain as her doses wore off. Julia went along when we went to school to do the homework drop off/pick up and all her classmates came by to sign her cast. We also had some visitors to our home this evening, and they all signed the cast, too. There's not going to be room for new signatures if this keeps up! I stayed home with Julia today. We laid very low, just watching movies, TV and other general hanging out. Her leg was feeling much better as the day wore on, and she stretched her ibuprofen so she only needed 3 doses, at 7:00AM, 3:00PM, and bedtime at 9:00PM. She's also getting pretty good at getting around on crutches. We agreed that if she slept well in her own bed tonight, she could try going to school tomorrow. We emailed the doctors at Children's to let them know what happened to Julia. Dr. S.'s response was very interesting. He sad that although he was sorry to hear that Julia was hurt, he was glad to hear that she did it while playing soccer. I guess that sometimes, normal childhood injuries can be reassuring! Dr. A.W. also wrote back. She said she was sorry to hear about Julia's injury, but that it sounded like we were in good hands. She didn't think that this would be likely to change her blood work, but it might be possible, given that the injury could have potentially bruised some mucles as well injuring her bone. Given that theoretical possibility, she intimated that we might want to wait a little while before having blood work done (we were going to go in this weekend). Fair enough. We'll postpone the blood work for a week or so. Julia slept in her own bed last night and seems to be having less and less pain and discomfort from the break. We allowed her to go to school today. There is only today and tomorrow for the rest of the school year, and she should have an easy time of it. The school staff is being extremely cooperative as they always have been with her. Julia actually had a very good day at work with little problems. We arranged to drop her off and pick her up early, to avoid the usual rush at the regular start and stop times. Julia reports that she had a pleasant and largely uneventful last day of school. One of her classmates did bump into her leg, which caused her a bit of pain, but it was no biggie. She also got her final report card for the year today. Yes, she continued her streak of all A+ grades in all her classes, a clean sweep for all four marking periods for the year! Julia is truly an incredible student who works very hard to earn the grades she receives, and should be proud of herself. Nice job, Julia! Tonightm, she also had to miss a birthday party she was invited to. It was a pool party, and she would have had to sit on the sidelines and watch her friends play. She opted to stay home instead. She was pretty bummed out about this. Julia reported some general achiness of her leg, but it also seems to be getting hurting her less and less often. Julia is spending the weekend at her grandfather's house because her mother and I are off helping to present a Marriage Encounter weekend.Julia is pretty much ache and pain free with her leg, but cabin fever (boredom!) is setting in. She can only read so many book, watch so much TV, and surf so many web sites before it gets to her! We took today off so that we could do what Julia wanted because she was so cooperative in letting us get away this weekend. She wanted to see a movie, and picked Minority Report. It's a two-and-a-half hour movie, but it took us almost 7 hours to see it! We went to one theater, and about 2 hours into the movie, the power went out!! There was no hope that the power would get restored any time soon, so we took some free passes instead. We decided we wanted to see the rest of the movie, so we drove 25 minutes to another theatre and watched the movie all over again. This time, we got all the way through it. It's a pretty good movie with plenty of action and lots of plot twists to keep you interested. Julia spent the day at a Babysitting class. This was a class run by our town. There were a bunch of kids her age or thereabouts in the class. She said it was not too much of a hinderance for her to be on crutches, as it was just basically a series of lectures. They covered the basics of first aid, situation handling, etc. She has a certificate to prove it! Julia has been hanging around kids of all ages for a long time with her day care, so she is way ahead of most kids who want to babysit, but it's good to have that certificate under her belt. Julia went to the eye doctor this afternoon and got a clean bill of visual health, except her nearsightedness has deterioriated a little in the past 6 months. We already suspected this, as Julia had been complaining about not being able to see so well. We ordered her new glasses in a funky, narrower style, and she also has clip-on sunglasses. Julia's mom took her in to Children's for her monthly bloodwork today. Afterward, they went to see Lilo & Stitch, which they both liked.